Thanks for your nice comments on my bedroom makeover! I’m back, as promised, with details on the wall art. I bought cheap wood trim, which I cut to size (about a half inch wider than the 24” print) and then stained. I used my chop saw but this could be done very easily with a handsaw. I found gold binder clips at OfficeMax – the metal color is cheaper looking than I would like and I thought about spray painting them more of a brass color, but that wave of craziness passed. They’re fine as-is. Note to self: access your uncrazy side more often. I simply clipped the prints to the trim at top and bottom and then used brass tack nails to hang the art. The prints from Staples were $4 each, the clips were less than $5 with a coupon and the wood trim was also $5: under $25 all totaled for a wall of art. My images came from the Charles W. Cushman Photograph Collection, thanks to Indiana University’s Digital Library Program. I upped the contrast of the photographs before submitting to Staples for printing, to help retain some of the details in the black and white conversion. The black border from Cushman’s Kodachrome color slides works well for this display style, creating a natural frame for the image. I love Cushman’s photographs. They hearken to a simpler time, when girls skipped rope and beer flowed from water towers and babies drank that beer while wearing berets without any fear of judgment. Haters gonna hate, baby: you be you. Update: Pretty readers Erin and Megan report that print shops may be giving some attitude about using engineering prints for photographs. This is somewhat understandable, as photos certainly use substatially more ink than blueprints, but I would hope they simply adjust their pricing rather than banning it outright. I submitted my photos online and did not encounter any sass. “Makeover” actually isn’t the right word because the bedroom was never maked to begin with. 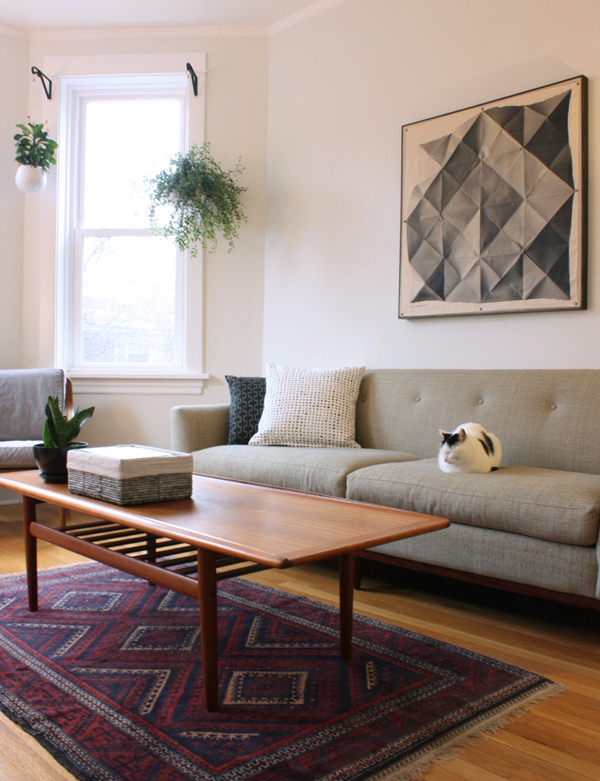 We had an off-white carpet remnant rug that got dingy nearly immediately – terrible idea! We had a picture ledge that I always intended to style but never did. We had matching MALM nightstands that were too small. I later bought an old pair of nightstands (one seen on the right) on Craigslist that I refinished, immediately decided that I didn’t like and then sold for a profit. I swapped out rugs, blankets, etc. as I honed in on what I wanted and didn’t want — the former is always much harder for me than the latter — and I finally gathered all of the pieces and put everything together in one exhausting weekend. I bought a new rug from Overstock and stained, painted and added hardware to a new pair of IKEA RAST nightstands. The wall art and framing was less than $25 total, and I reupholstered our existing headboard with new fabric, adding nailhead trim. I swapped the dresser with one I had in the basement and plopped a plant in a basket. Doozy is indifferent to the changes but I am pleased to finally have a bedroom that feels put together. I will write follow-up posts on the headboard, art and nightstands, so check back later this week if you’re interested in details on any of those projects! 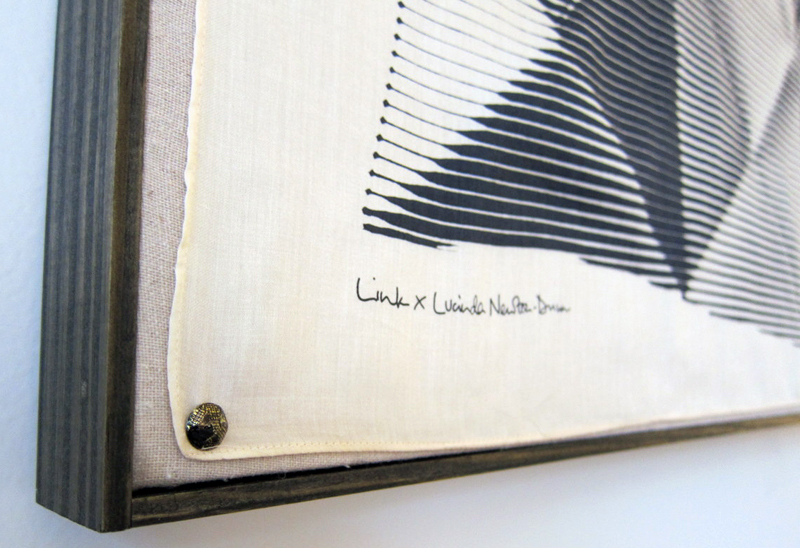 Link says: “Furoshiki (風呂敷, fu-rosh-ki) is a type of traditional Japanese wrapping cloth. Each of our products has been hand printed in Japan, using traditional printing techniques.” Check out Spoon & Tamago for an interview and some great photographs of the production process. 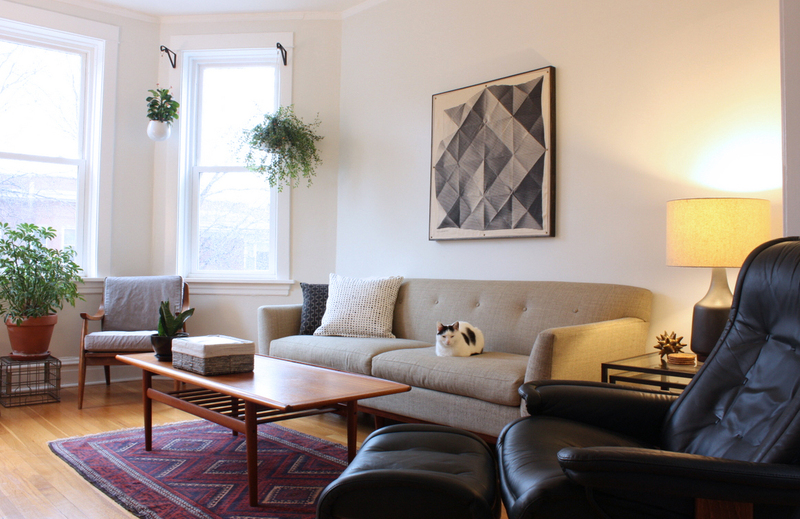 Because I have a gallery wall of black frames in our dining room, I thought something large, textured and non-black-framed would be nice above our sofa. This furoshiki seemed like a good bet. Airmail is the best mail, no? I wanted something more substantial than simply hanging the scarf on the wall, so I bought a 36″x36″ stretched canvas and set to building a frame to wrap around it. I used inexpensive pine lattice trim, which I stained with Minwax Wood Finish in Ebony. I wrapped the canvas with some lightweight, neutral fabric I had on hand. It’s barely visible, but I think it’s a much more polished-looking background for the scarf than the bare canvas would have been. I used my chop saw to make simple right-angle corners and nailed the wood around the frame, staining the cut edges and using wood filler to disguise any nail holes. For the final step, I attached the scarf to the canvas with brass upholstery tacks. I punctured the scarf with a fine needle first, to avoid pulling any fabric threads, and then inserted the tack through the opening. That’s it! Doozy worked his angles like a pro as I took these photos. Just kidding: a proper catloaf does not have angles.